Environmental students have been sifting through piles of garbage from the Richmond campus to gather vital information about the school’s disposal system. On Oct. 19, environmental protection technology students began conducting aa two-day garbage audit in order to determine whether it would be beneficial to start a composting program. “We’re trying to get an idea of how much garbage Kwantlen is producing and where it’s coming from. Once we can quantify all of it, we’ll try to make some suggestions of what to do with it: whether it would be worth it to have our own composting facility or just participate in Richmond’s composting program,” says Mike Ferko, who’s in charge of the audit. “We collected garbage from various sites, such as the hallways, the washrooms, the cafeteria and outside. We weighed it, compared it and we’re analyzing the results so we can write a report about it,” says Neil Brooks, a second-year student and first-time participant of the audit. “UBC has a huge composting facility, and we’re trying to draw some comparisons between us and them to see if it’s feasible. They have a huge horticulture program, so they produce a lot more waste than we do,” says Ferko. “In the cafeteria and kitchens, there were a lot of things that we found that could be composted or recycled,” says Brooks. Ferko says that saving money on garbage removal would be a major benefit of a successful composting program. “It cost money to send waste to the landfill. Composting is basically taking nutrients from your food, your banana peels and such, and breaking them down into soil so plants can use them again. But you’re not supposed to compost meat because you’ll attract pests and rats and raccoons,” says Ferko. “The experience itself was pretty gross. I was digging through trash from the cafeteria that must have been three days old, just sitting in a room in garbage bags. So the actual experience, I’m not going to rush back to do it again,” says John Currie, a second-year student also participating for the first time in the audit. 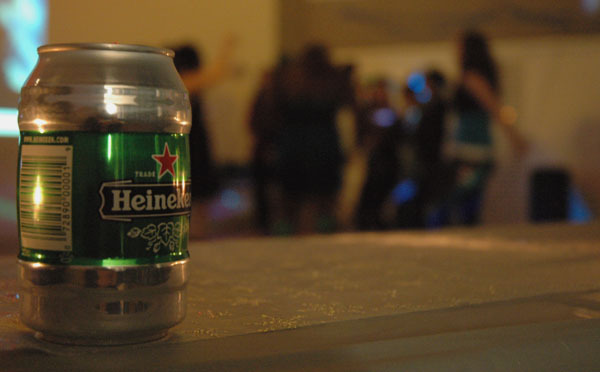 Three-dollar beers and an empty dance floor? Preposterous. On Oct. 9, the KSA hosted a Lady Gaga-themed “Monster Ball” dance in the Conference Centre on the Richmond campus, which sadly suffered from a lacklustre crowd. With professional lighting and a live DJ, free cans of Coke and bottled water on top of $3 cans of Molson Canadian and Heineken, the KSA did well in providing what had the potential to be a wild Tuesday night. Perhaps students don’t see Richmond as the campus for extra-curricular activities or social events. Perhaps Kwantlen students have a poor outlook of the KSA. Either way, the effort to bring the student body together outside of class was there. 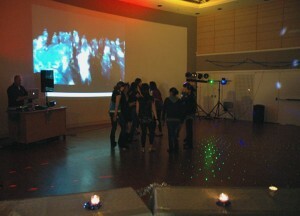 Just before Halloween, the KSA organized a similar event on the Surrey campus and filled the venue. 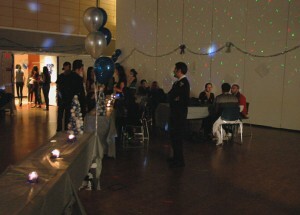 The event brought out few people, but for those who showed up, the 'night out' mood was still in the air. (Photo by: Lucas Meneses-Skoda). “Well, in the end, the reason I feel a lot of people aren’t showing up is not because the promotions are wrong, it’s not because the setup is bad, it’s not because the alcohol is overly priced or anything along those lines,” said Luke Arathoon, Kwantlen’s Volunteer Co-ordinator. Unfortunately, it seems like Kwantlen students think that “good” events can only happen at the “good” campus. For the KSA, this has become a frustrating issue. The KSA is eager to cultivate a social vibe, but it is difficult when the student body doesn’t show enthusiasm. “I didn’t want to go, because I didn’t think anyone else was going. I didn’t want to be the only person there,” said Sarena Mann, 20, who studies general arts. “I think [the KSA] has done a really bad job of making the Richmond campus a student community. People come here just to study and that’s it,” said Jonathan Hubele, who studies accounting. Arathoon says that for years, students have nagged the KSA for a school dance. Apart from the dance floor, there was a section of with tables and chairs where students could enjoy their drinks and relax. (Photo by: Lucas Meneses-Skoda). Arathoon hopes that students will change the way they think about these events, and help to build more optimism around the campus. If negativity leads to more negativity, then the opposite must be true as well. Essentially, the more students who approach these events with an open mind, the more likely they are to thrive. The fact is, school is meant to be a social environment, and we’re all interested in hanging out and letting loose. So the next time there’s a dance, shindig or celebration, don’t ask questions — make a point of going with your party hat on and leaving your study cap at home. Hello, Africa! 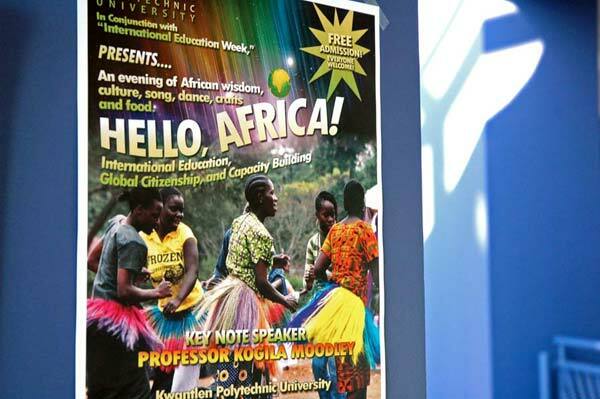 kicks off International Education Week at Kwantlen on Monday and features a keynote address from UBC sociology Professor Kogila Moodley. “This event came about as a result of myself and two colleagues going to Kenya this summer,” said Joan Nesbitt, who is part of Kwantlen’s criminology faculty and is an organizer of the gala. “The three of us went to Kenya to look at the feasibility of setting up international field schools there,” she said. Part of the grant that paid for the trip to Kenya included a community dialogue session back at home, leading to Hello, Africa! Moodley’s address is titled “Gandhi & Mandela: Reconciliation in Divided Societies” and is expected to touch on themes of building dialogue between local communities in the developed Western world and the continent of Africa, or the global south at large. Nesbitt and her colleagues are in the very early stages of setting up international field schools in Kenya and Tanzania, where Kwantlen criminology or sociology students may be able to go on exchange. Monday’s event is meant to highlight the importance of exchanges and of sharing educational resources between communities. It is sponsored by Kwantlen’s criminology department. Moodley, according to the Hello, Africa! program, is professor of sociology at the University of British Columbia, where she was the first holder of the David Lam Chair in Multicultural Studies. 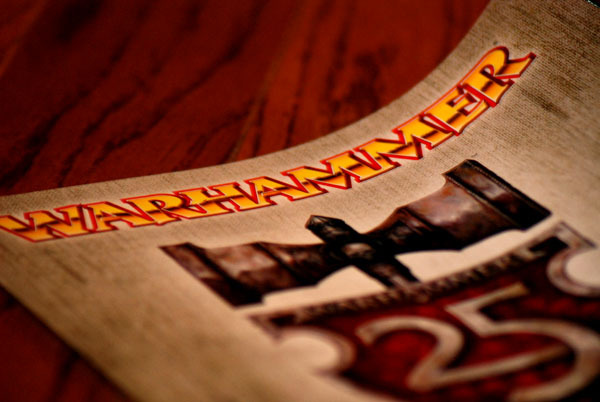 Warhammer, a table-based miniature war game, is “the coolest thing you’ve never heard of,” according to Doug Widdes, an employee at the Games Workshop in Metrotown mall. The game is part strategy, part art, and its players are all passion. In this 18-minute audio piece, we step inside the world of Warhammer for a few moments to get an overview of the game and meet some of the players. Finding a soulmate can be tough. When the club and bar scenes aren’t cutting it and Mr. Right hasn’t managed to pop up in everyday life, some, including university students, are turning to the internet for dating. In fact, last year the Boston Globe reported the use of online dating among college-age students is rising. Emmeli Rosenberg Lassesen, 25, had a difficult time finding the right guy. She found that looking at options online allowed her to narrow the field down a good match. “I’m tall, so I think for me that was one of the things that’s hard to find when [I] meet people, ’cause I like taller guys,” said Rosenberg Lassesen. Four months ago, Rosenberg Lassesen found success on the site when she met her boyfriend, Adam Gill. “He messaged me first. I’ve done the online dating thing for a while and I’ve always just had a policy that if a guy likes me he’s gonna message me. I’m kind of old-fashioned,” she said. “The big thing for me is I wouldn’t add someone on Facebook until I talked to them on MSN for long enough that I felt I had a good gauge of who they were. If you add someone on Facebook, they have your last name so there’s a safety issue with that. Other popular dating sites include Match.com, lifematescanada.com, and Okcupid.com. When it comes time to select classes for the next semester, it can be hard to know what each class is going to be like. To help, students have ratemyprofessors.com. The site, which was started in 1999, has compiled over 11 million student-based rankings of teachers at more than 6,000 schools in the United States, Canada, England, Scotland and Wales to help students find the kind of professor they are looking for. “It helps students to know more about their instructors. We hope to find an instructor that works for us. 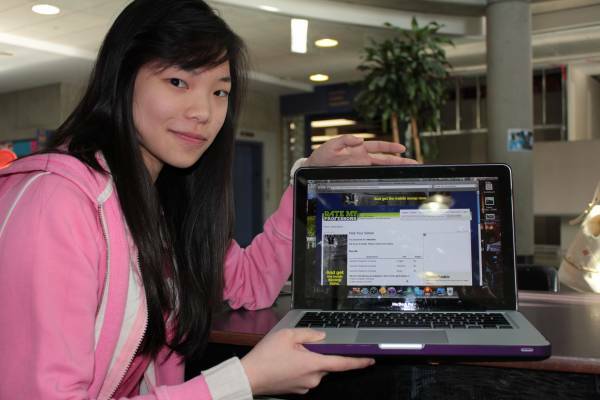 I think that it’s beneficial for students,” said Sandy Wong, a Kwantlen human resource student. The site asks students to rate current and past teachers on easiness, helpfulness and clarity, so that future students can get a feel for the type of teacher they are going to have even before they step into the classroom. “I know some students check it before they enrol in class to see who the professor is and it kind of sways if they are going to enrol in that class,” said Caitlin Penberthy, an environmental protection program student. Kwantlen’s average ratings on the site are quite low compared to other universities in the Lower Mainland. While SFU, UBC and UFV have average ratings of 3.24, 3.29 and 3.54, Kwantlen is averaging just 2.7. “It’s subjective. If you don’t get a good mark, then obviously you’re going to be upset and write something that’s not so great. I would hope that if teachers look at it, they would understand it’s subjective,” said Penberthy. Kwantlen’s aboriginal group may have just been made offical on Friday, but it already has great plans. Members of the club, which meets Wednesdays at 4:30 p.m. at Kwantlen’s Aboriginal Gathering Place, have already come up with ideas for members, including ultimate frisbee and a canoe trip. 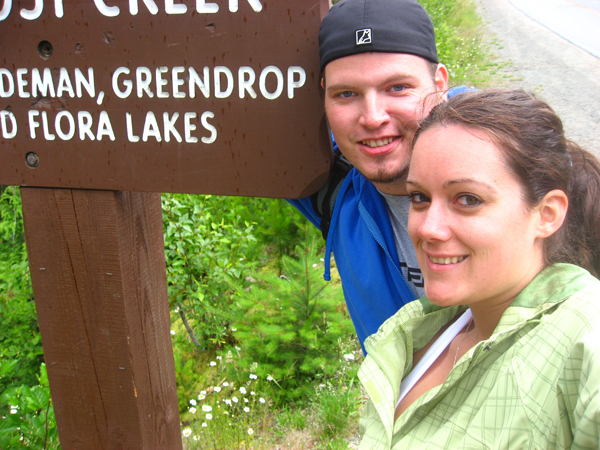 “They want to do fundraising for a canoe trip. That’s traditional to the Semiahmoo tribe and very spiritual,” said Bige, adding that they hope to do it in the summer. In addition to recreational activities, the club also has big plans to get involved politically. “The more political [students], like myself, want to do conferences on indigenous rights and stuff around the world. Right now, we just participated in a campaign for GIA, which is Global Indigenous Youth for Action. It’s part of the United Nations. We just took some pictures with some signs that support the group,” she said. The priority for the club is also to provide education on aboriginal culture and issues. Although the club’s focus is on aboriginal culture and identity, Bige said membership is not limited to aboriginals, and encourages people of all ethnicities to drop by. On Nov. 17, the club will meet at 4 p.m. at the Grassroots Cafe instead of the gathering room. For more information, contact Melinda Bige at melinda_bige@hotmail.com.